Today marks the first anniversary of mangaka Yoshino Sakumi’s death on April 20, 2016. The sad news came as a tremendous shock to many of us as it was so sudden and unexpected. 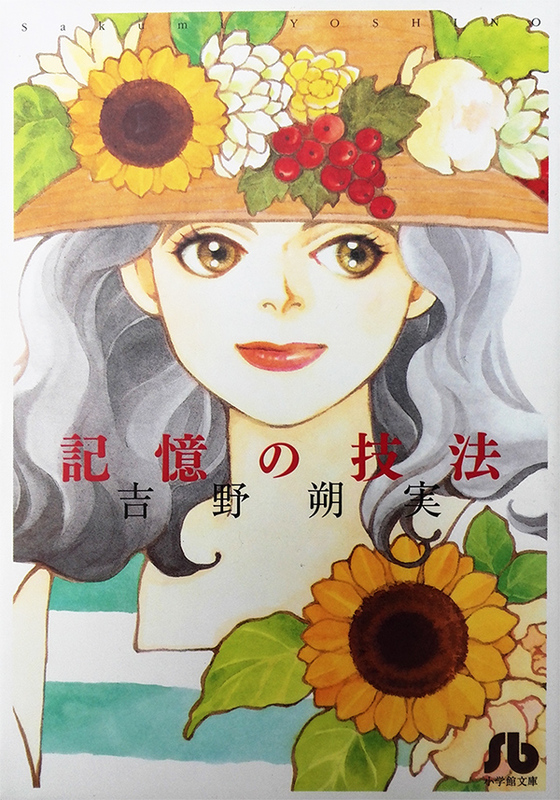 Yoshino Sakumi, born in 1959, debuted in 1980 in Shueisha’s now folded Bouquet magazine and made a name for herself with works featuring memorably quirky characters, often twins, just as often going through a serious identity crisis, and exploring the depths of the human mind and soul. 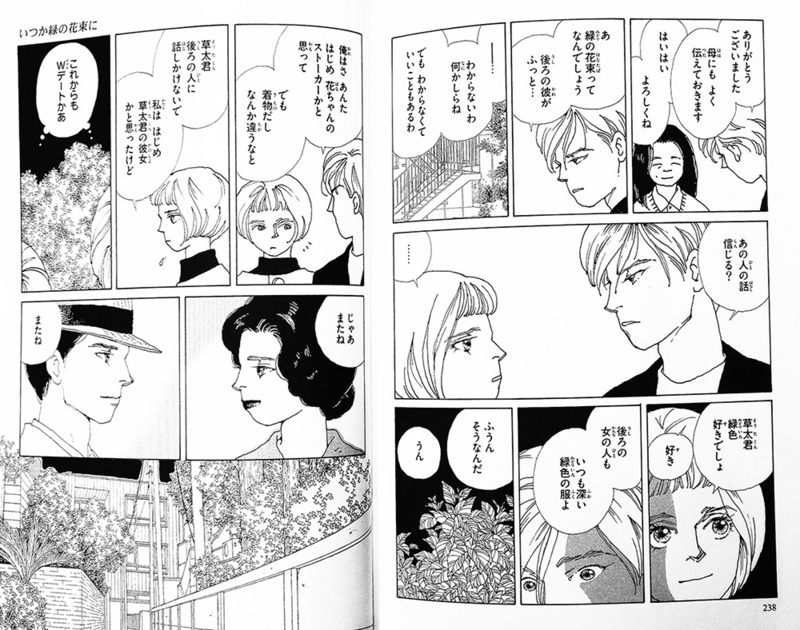 Shōnen wa kōya wo mezasu (1985-1987), Juliette no tamago (1988-1989) or the long-running period, published in Shogakukan’s defunct seinen magazine IKKI from 2004 to 2014, are among her most beloved and well-known works. Yoshino was also a respected film and literary critic and essayist. The works of her late period are closely linked with Shogakukan’s Gekkan flowers magazine. One of her strongest manga, the psychological thriller and human drama Kioku no gihō (highly recommended if you want to buy one single bunko volume to sample the authors work, be prepared for some emotional shocks though! ), was published in the very first issue of the magazine in 2002 and a colour illustration for it was used on the cover. Through the first and second decade of the new millenium, she kept coming back to the magazine for more one-shots and visually intriguing two-tone comics. 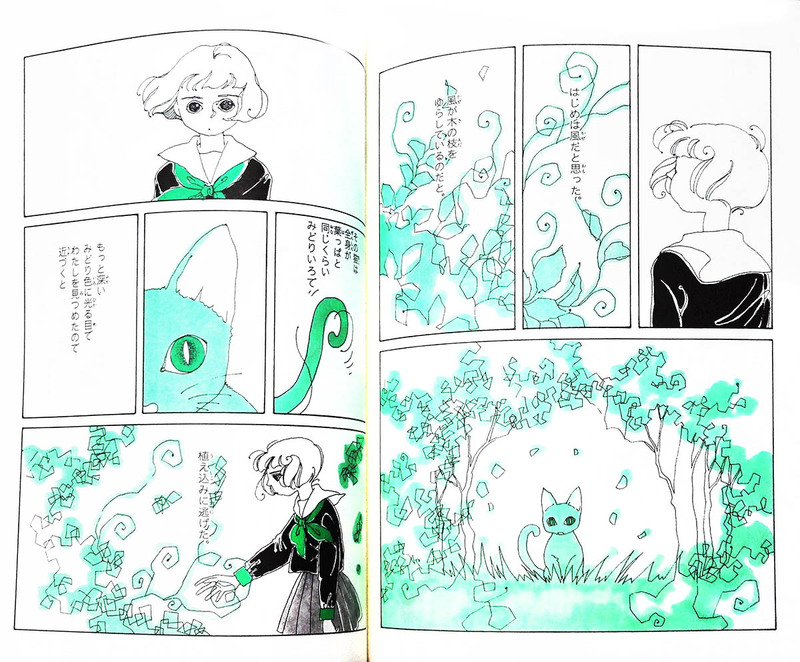 These last works, previously unpublished in comic book form, were lovingly compiled by the editors at flowers and turned into a beautifully designed single volume called Itsuka midori no hanataba (A Green Bouquet For You). The large A5 format book comes with a transparent dust jacket printed with flowers and contains several short and super short stories showcasing the range of this extremely talented author who had to leave this earth much too soon. The title story is a romantic and touching ghost story while in the others included, readers will chance upon a dream dragon, a watermelon bringing possible death by doppelgänger, a princess with a bat as her earring, a green cat reminding a young woman of her guilty conscience, a woman obsessed with her fortune teller and an undertaker being the only one left after the powerhungry kings of the world have killed each other. 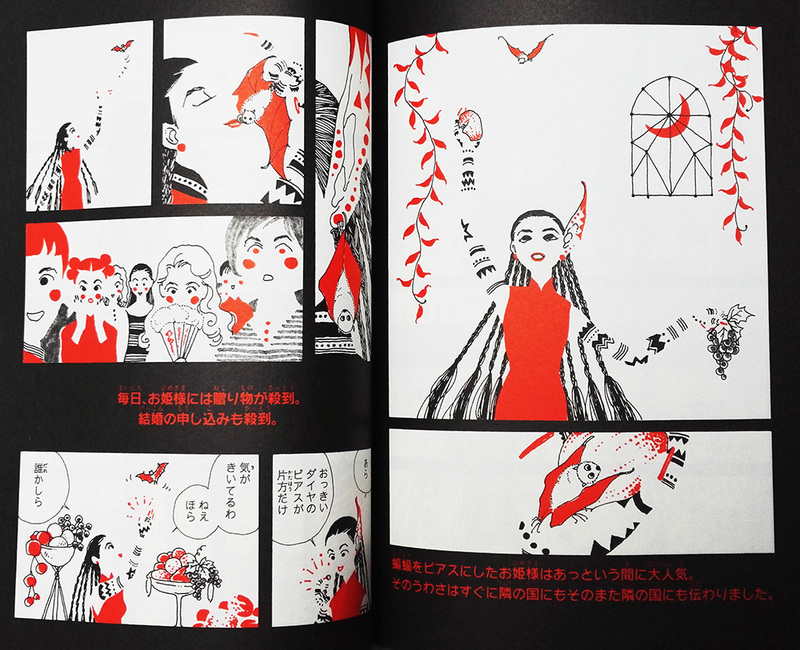 Like many of Yoshino’s works, these stories depict the nature of us humans with a sharp sense for our dark side, but also with gentleness, poignancy and tongue-in-cheek humour. The largest part of the book is reserved for her second-to-last published short story, MOTHER, which was supposed to be continued soon in flowers until death ended this fantastic artist’s career. 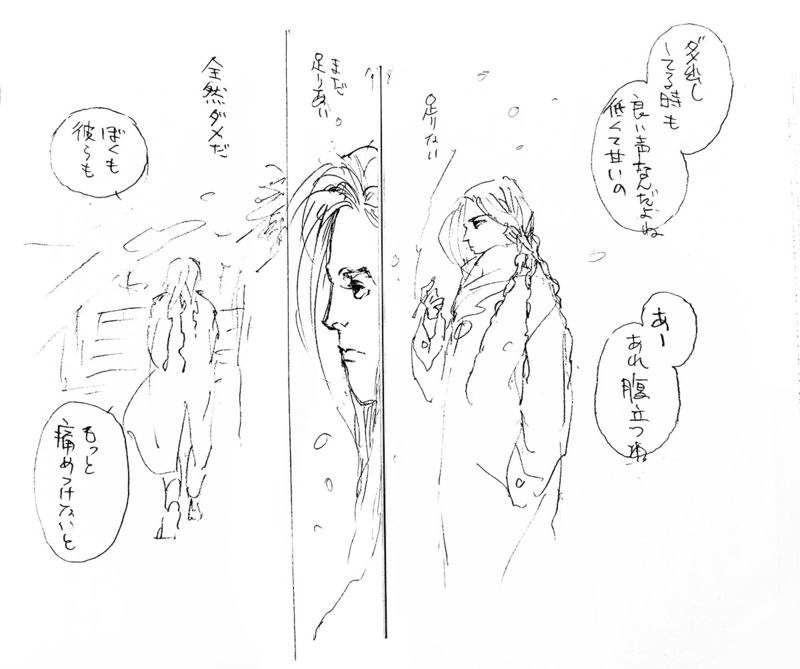 The unfinished 100-page rough script (called nēmu/name in Japanese) composed of dialogues and pencil-drawn sketches for the manga layout is also included in the book. It’s surprisingly readable and, as a look behind the scenes, interesting from a manga fan’s point of view, the story itself being a post-apocalyptic sci-fi vision of the future, in tone and subject very similar to some of Hagio Moto‘s works. 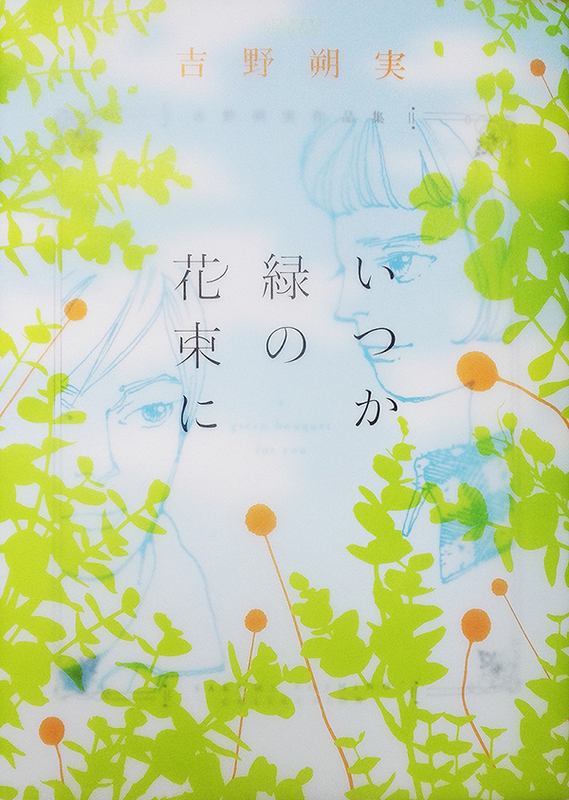 As much as I miss Yoshino-sensei and would have loved to see her work on something longer again after finishing period, this wonderful book provides something like closure, as chlichéd as it might sound. She’ll always be in the top ten of my favourite mangaka and I hope her unique, sometimes shocking, always moving works will continue to fascinate readers for many years to come! Additional information: Last collection of short stories, published in December 2016 after the artist’s death on April 20, 2016. Contains works previously published in Gekkan flowers from 2004 to 2016: MOTHER and the unpublished follow-up in raw script form (name), the title story plus 3 other very short one-shots and 4 two-tone one-shots (black & red, black & green), plus a gallery of colour artworks, author comments and an interview recorded shortly before her death. 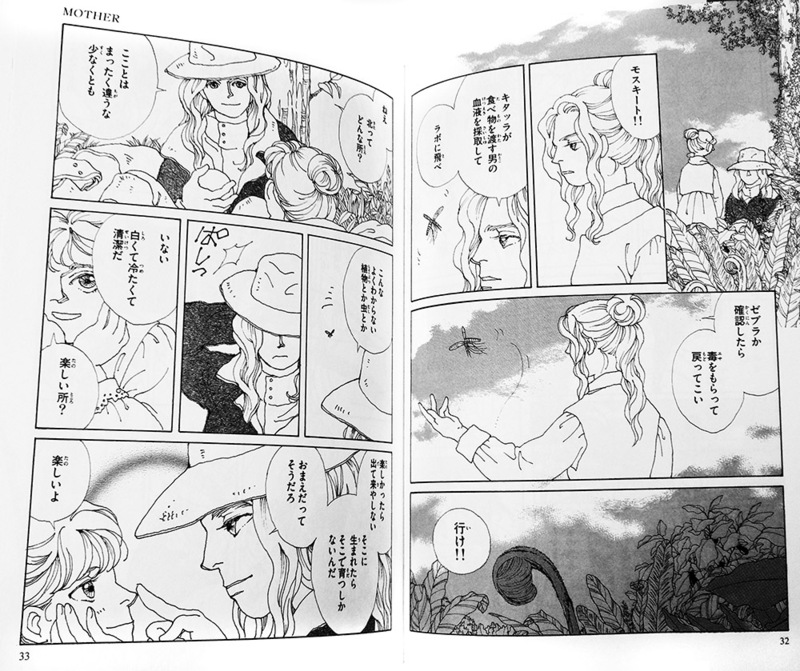 More info at Shogakukan Comic. 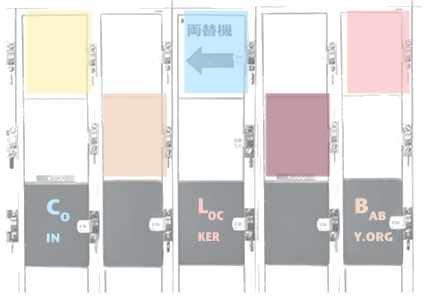 Categories: Manga Review, Mangaka Profile. Tags: genre: human drama, genre: science fiction, keyword: death, keyword: magical realism, magazine: flowers, mangaka: yoshino sakumi, publisher: shogakukan, type: shoujo manga. Posted on Apr 20, 2017 (Thu, 11:57 pm). . The first 20 minutes were terrible. When I think back now, they just blur into this mess of silly dialogue (although that was to be expected, it’s Star Wars after all ;) ) and fight after fight after fight. But it was absolutely worth enduring it all. Absolutely. Because that looong first part was followed by some of the best scenes not only of the “new” trilogy but in all of Star Wars. That scene with Anakin and Padm� looking out onto the city in different buildings at sunset was absolutely breathtaking! It was probably the quietest scene in all 6 episodes and made it perfectly clear that it marks the turning point in the first (chronologically speaking) trilogy and is, after all, the reason for the existence of the second (“old”) trilogy. So atmospheric and touching. It was absolutely amazing. I simply loved the last third (or second half?) of the film. It was dark, visually impressive and surpisingly violent; fatalistic in the sense that it was obvious how everything would end, you could see everything coming (because we know “the future”, episodes IV-VI) and just had to accept everything. No happy end could spoil this, although there is hope and, of course, knowledge that everything will turn out well in the end. Yoda, Anakin killing the children, the whole volcano and “transformation” scene, Padm�’s funeral… highly impressive stuff. Tags: genre: science fiction, movie review, movie: star wars, movies: american movies. Posted on Jun 3, 2005 (Fri, 1:23 pm). . Finally got to see Mamoru Oshii’s Avalon tonight. I don’t think I’ve ever seen anything like it before, at least from a visual point of view. Absolutely stunning. The music by Kenji Kawai – overwhelming. If only the pacing of the plot wasn’t so bad >_< The atmosphere throughout 95% of the film is far from dense, in fact so stretched and thin I could see through my TV screen. Also, the lack of emotions in the acting makes for some nice two-dimensional characters (oh the irony!). Hell, I've never felt more distanced from a heroine before. The way she didn't care for the people who should be important to her made me not really care for her either. Ah, it's such a shame. This could've been such an amazing, wonderful, mind-blowing, awe-inducing film. *dies* A must-see for any science fiction, heck any movie enthusiast, nevertheless. Just give it a lot of time; especially the last third of the movie is worth a million mediocre Hollywood flicks. Tags: director: oshii mamoru, genre: science fiction, movie review, musician: kawai kenji. Posted on Sep 5, 2004 (Sun, 1:12 am). .